I\\\'m David from Norway. I\\\'m a composer, arranger and producer. 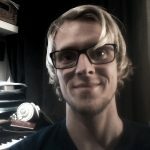 I would like to help you with the music and melody for your next project. I have my background with orchestral music and different instrumental soundtracks. I\\\'m happy to be at any help with the music you need.